Before we talk about the Ventricular Septal defect surgery India, we need to know about this ailment. Well, Ventricular Septal defect is nothing but a hole (defect), which is seen in the wall and this separates the lower chambers over the heart. The heart’s lower chambers are known as the ventricles, while the wall that separates the two is called the ventricular septum. In the normal shaped heart, the septum is known to prevent the blood from flowing directly from the ventricle to another. As you look further, you can find the VSD blood flowing inside the two ventricles, which is a congenital heart defect. This is often seen among the infants as the ailment start inside the womb as the fetus grows. Who are the best surgeons for ventricular septal defect surgery in India? When it comes to the cardiac surgeons dealing with the Ventricular Septal defect surgery in India, there are many. All these doctors have been known for their skills and experience, which together have developed a good expertise in dealing with such complex heart surgery. They are known for their high success rate and best results. How about checking them a few, which include Dr. Surendra Nath Khanna, Dr. Krishna Subramony Iyer, Dr. Z S Meharwal, Dr. Yugal K Mishra, Dr. Yugal K Mishra, Dr. K R Balakrishnan, Dr. Sanjay Gupta, Dr. Raju Vyas, and Dr. Naresh Trehan. These are engaged in top hospitals like Fortis, Apollo, Max Healthcare, and Kokilaben Hospital to name a few. If you talk about the Ventricular Septal defect surgery in India, there are several best places to consider in the country. Well, some of the top hospitals dealing with the VSD ailment include Fortis Escorts Heart Institute and Research Centre, Delhi, Max Healthcare Hospital, Kokilaben Multispecialty Hospital, Medanta – The Medicity, Indraprastha Apollo Hospital, JJ Hospital, Manipal Hospital, Artemis Hospital and Fortis Hospital. These hospitals have state of art facilities governed by top doctors and cardiac surgeons that give you the best of the healthcare services. Most of these hospitals are backed with top accreditations, which speak a lot about the quality factor. How can I get Low Cost ventricular septal defect surgery Treatment Benefits? There are several ways of getting the Ventricular Septal defect surgery India at an affordable cost and one such way is to get it from a top medical tourism company. These medical tourism companies often have the best network of doctors, surgeons, and hospitals dealing with the best heart care that offer the best of the healthcare services hard to find out at any other place. The medical tourism company also takes care of other things like the local travel and food along with a number of services the global patients would need in an alien nation. As said the medical tourism company helps you a lot when it comes to accessing the Ventricular Septal defect surgery India. You can easily connect with us by visiting: Indian Health Guru, wherein you get a contact form that has to be filled before availing the services. Once you fill the basic information you will get a call from the medical tourism rep discussing your requirement and thus you end up getting the best and most affordable package for the cardiac surgery called Ventricular Septal defect surgery India. 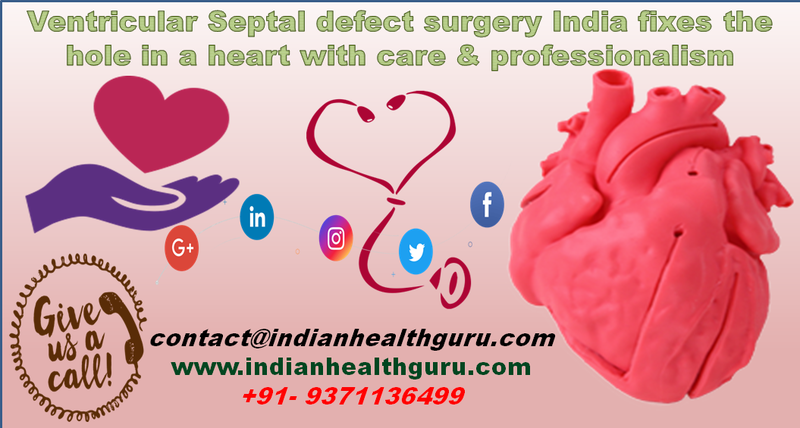 When it comes to accessing the Ventricular Septal defect surgery in India, you can easily get a number of services, which include getting the guidance for medical visa, complete assistance required during the surgery, giving you local travel, food as per your requirement, helping you connecting your family members back at home and many more other things. Also Read: Why Choose India for Ventricular Septal Defect Surgery?